A year ago, I’d have laughed at the thought of owning a bike computer. It seemed kinda nerdy, and I’m not really a gadget-y kinda guy. I mean, I don’t even have a cell phone yet! The old me didn’t see any point logging miles or looking at my average speed or the distance I was riding. All I cared about was that I rode as much as possible. 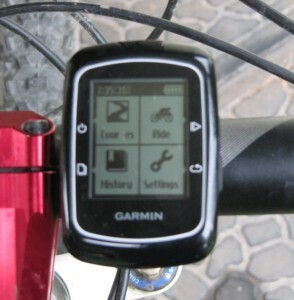 This changed when, out of the blue, my friend bought himself an expensive Garmin Edge 800 bike computer and began showing me some of his rides on the Garmin Connect service. Although the typical functions of a bike computer still didn’t appeal to me much, I found the ability to collect and store GPS data interesting. I saw the potential benefits and entertainment of being able to map my rides on top of Google Earth, for example, or keep a history of my rides, (where I went and when,) online to review any time I wanted to. After buying the computer and reading the user manual, I went to play around on my favourite trails to get some rides to upload to Garmin Connect, a service which is free to use for anybody who owns a Garmin GPS device. The Edge 200 can only display a few items while riding, (current speed, trip distance, riding time and average speed, ascent, or calories burnt) but in the background this little device is collecting much more information than that. Once you have uploaded a ride to Garmin Connect, you can examine maps, check out speed and elevation plots, and much, much more. Garmin’s online service is a great tool for analyzing and storing your riding data, but It never hurts to check out alternatives. A great one, which most riders are probably already aware of by now, is Strava. If your hearing about it for the first time here, Strava is basically a social site for runners and cyclists based on smart phone apps and data uploaded from GPS, and has been rapidly gaining in popularity. With a new GPS device of my own, I had to check out Strava to see what all the hype was about.but it offers a few really cool things that the Garmin site lacks. It allows you to create and view specific segments of a ride and analyze them, but not only that, it allows you to compare your time on any segment to your friends and anybody else who has ridden it. Strava is many things; vain, addictive, and self indulgent; to name just a few, but adding that tiny element of competition can be motivating. I’m not formally training, but since becoming a father 10 months ago, I have much less time to ride, so I try to get the most out of the few rides get by riding harder and taking less breaks. There’s no better inspiration to push your boundaries than a bit of healthy competition, even if you are just competing against yourself. I like this device more than I expected and I consider it to be a worthwhile addition to my riding kit. I know that the fancier Garmins come with a whole ton of extra features, like wheel and cadence sensors, heart rate monitors, barometric altimeters, and maps and stuff, but as I said, I’m not really training or anything, I’m just trying to get the most out of my riding. The Edge 200 allows me to set some goals, and monitor and analyze my performance over endless seasons of riding. If you need a GPS for navigation, than what you really need is the Edge 800, and if you are really serious about training and racing, then you will be better served by the Edge 500 or 510. Where the Edge 200 really shines is the price of $130, (half the price of the 500 and a quarter of the price of the 800.) Unlike your typical non-GPS bike computer, It doesn’t require any wires, sensors or wheel magnets. It will log your ride even if you just put it in your pocket. Switching bikes is never a problem. All that and I would say the main reason to purchase this device over any normal bike computer is the ability to have complete GPS data logged and saved to the device that you can put to use in so many ways. If you are already using Strava or some other phone app for logging your rides and wondering if you might still be well served by this device, there are a couple points I can think to consider: Garmin’s GPS is considered to be more accurate than the phone apps, and the battery on this device is claimed to last 14 hours, which appears accurate judging by my observation that after three hours riding the battery indicator shows about 85%. More accurate ride data might be important for some people, and on long rides, it might be a good idea to save your phone battery in case of emergency. Before writing this piece, I searched for good reviews on the Garmin Edge 200 Bike computer, and found some really good ones. I decided not to go to in depth in this post, since it has already been done here: DC Rainmaker: Garmin Edge 200 In Depth Review. I suggest you read that review if you are considering buying this device. I also found the Garmin Edge 200 Review on BikeRadar.com to be a good one. All said and done, I have only positive things to say about the Garmin Edge 200 and would recommend it to anyone seeking a basic bike computer and doesn’t need the extra functions of fancier GPS units. Considering the price of this device, and how much fun you can have with it, I really don’t see any point getting a less expensive bike computer without GPS. Thanks for reading! Comments are always appreciated! I almost bought that one but ended up with a Cat Eye (no GPS). Can you use Garmin’s map software to chart your rides and elevation gain? Yes! The Garmin Connect service is really cool, and best of all, it’s free for Garmin owners. You can see your ride overlayed on your choice on Bing or Google Maps using terrain, street, or satellite views, as well as track elevation, distance, speed, average speed, etc… And if you purchase one of the higher end Garmins with Heart rate monitor and cadence sensor, or purchase a power meter that uses ANT wireless, you can track all that stuff too. Garmin Edge 200 is the good computer for road and mountain bikes. Thanks for your awesome post. 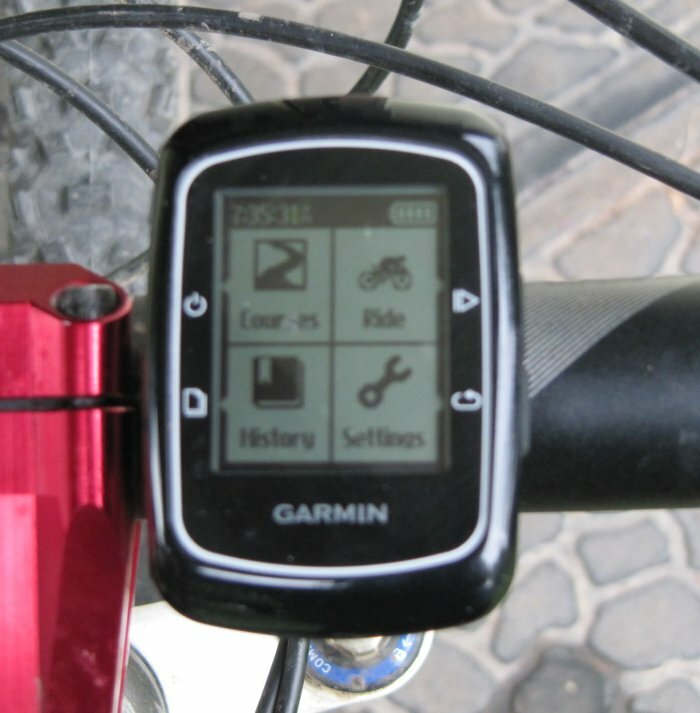 Garmin Edge 200 is a perfect computer for mountain biking. I have been using it last 8 month and it is performing very well.